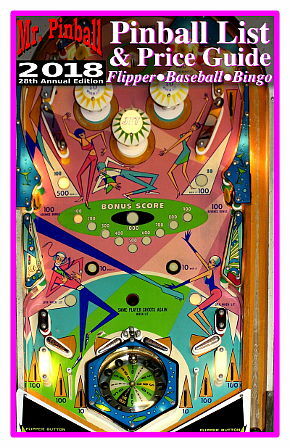 The 2018 Edition, our 28th annual edition, contains important information about all pinball machines made since the flipper was invented in 1947. This is the most popular and accurate pinball reference anywhere. Over 3,000 pinball machines are listed with incredible detail about each, including name, manufacturer, date released, number of players, distinguishing features, production numbers, collectibility, current value, market trend, designer, artist, and relationships with other games. Note that included in the pricing analysis are charts of price trends and values and a list of the top five games, by decade and by type. The book also contains current website links to on-line resources for buying and selling parts and machines, popular pinball events, and how to find more information--everything a new collector or pinball enthusiast needs to know. Nowhere else can you find as comprehensive and complete reference on pinball. No collector, novice or expert, can afford to be without the latest edition from Mr. Pinball. Added bonus sections--a comprehensive list of Bowling Games and a comprehensive list of Gun Games since these are often found with pinball games. What's New in the 2018 Edition! You can obtain a 3 page sample of our 2003 Edition in PDF format by clicking here. Contains all information in Standard Version in a downloadable ZIP-compressed file. The link will be sent to you via e-mail. Includes plain ASCII text, unformatted, tab-delimited data--easily imported into your favorite word processor, database, or spreadsheet on a Macintosh, IBM PC, or Linux computer. Includes PDF format file of the entire book. Includes spreadsheet files in Microsoft Excel and Open Data formats. Shipping is free and only by download. You can only order this version direct from us and you must provide an email address to order. Contact us if you are interested in this version. We have a few older copies from previous years available. When these are gone, they're gone! Any old edition not listed here is no longer available. Please contact us first about ordering one of these to ensure we still have it in stock. Ask about shipping.